In his second letter to the Thessalonians, Paul faced the reality that was the natural consequence of the expecting the imminent end of the world. This fact is that some of the Christians in the Church of Thessaloniki, had stopped working and were living on others’ money because of their Apocalyptic beliefs. In this letter, Paul, in addition to accepting and repeating the belief of the Second Coming of Christ, warns people not to be unsettled by words of mouth or letters that are attributed to us —and assert that the Day of the Second Coming of the Lord (Christ) has already come. (2 Thessalonians 2:1-3). In the following Paul expresses the incidents which occurs before the “The Lord’s Day” (the day of The Second Coming of Christ), (2 Thessalonians 2:4 and 8 and 9). In this letter, Paul confirms the belief of those who expect the imminent Second Coming of Christ; however, he asks them not to develop their expectation to the extent which get them away from daily life. He also asks them not to stop working, and not to get disappointed as they face the delay in fulfilling the expectation of The Second Coming of Christ and not to cause a crisis in the Early Church with those consequences. 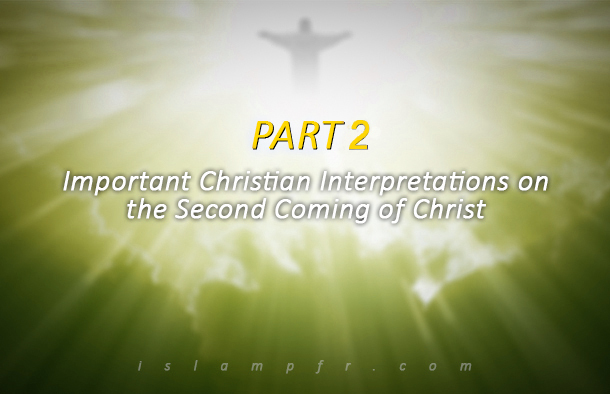 However Paul has been quiet at some occasions that he is expected to talk about Christ’s Second Coming. He talks about death as “crumbling of the earthly tent” and then obtaining “an eternal heavenly dwelling” that God has built it, in the Second Epistle to the Corinthians (2 Corinthians 5:1-10), but he doesn’t mention anything about Jesus Second Coming or the resurrection of the dead. In this sentence, the death itself is the point that causes the Christian believer achieve the spiritual salvation. Also in his letter to the Philippians (Philippians 1:21-25) when he talks about the necessity of his staying alive, he doesn’t see his surviving as waiting for the Second Coming of Christ and meeting him, but merely as an opportunity to serve Christians more, yet it results in his separation from Christ. In total, it can be understood from Paul’s words about the Second Coming of Jesus Christ that on the one hand, he had a role in early church belief of the imminent Second Coming of their savior, but on the other hand, since he felt responsibility and thought that with his dream and his Revelation he has been chosen as a special apostle of Jesus to lead others and also since he was more educated than other apostles and had more foresight, he didn’t want waiting for Second Coming of Jesus prevent the growth and consolidation of the nascent Church. Sometimes, he acted in a way as if he could guess that there is no news of the Second Coming of Jesus for long years. The twofold position of Paul can be observed in the Christian marriage topic as well. He wants church members to abstain from marriage because he believes “we have a very short time and a very little opportunity for doing what satisfies the Lord’s” (1 Corinthians 7:29). But on the other hand, as someone who feels responsible for the mental health of the church followers, he permits everyone who likes to get married, get marry (Ibid. 7:36). Also, it seems that his view about how Jesus Christ’s Second Coming is, and his view about the final salvation is different from other followers and the apostles of Christ in the early church. Unlike those who waited for physical and imminent return of Jesus Christ, he referred to spiritual salvation that perhaps has nothing to do with the physical coming of Jesus Christ in the Apocalypse. This approach became the basis of interpretations of people like Origen and Augustine. In the following we will discuss them. Creeds are statements which begin with the phrase “I believe”) (and generally have been issued by the Christian Councils after the doctrinal disputes (McGrath 2005:55). In the Early Christian Church, two important Creeds were credible and were respected in all over the Church: the Apostles’ Creed and Nicene Creed. Both Creeds consists of twelve principles of the Christian beliefs that half of them, that is, six principles, are dedicated to Jesus and his Second Coming. He is the only begotten Son of God, and He was born of the Virgin Mary by the Holy Spirit and at the time of a tyrant governor was crucified and was buried. After expressing these characteristics, the authors of the creed point out the first resurrection or the first coming of the Christ and His resurrection from the dead and that he is currently alive and sits on the right side of God the Father. The place where Christ is and will return from there is the heaven. The place where Jesus Christ is, is beside God the father. Jesus is present in this place and that position with his body; because in the second paragraph of the Creed it has been pointed out that: “On the third day, he rose from the dead” and we know that he will have a Second Coming physically and with a stunning glory. Jesus Christ will have a Second Coming to judge the living and the dead. We believe in one God, the Father almighty, creator of all visible and invisible things. And in one Lord Jesus Christ, the only Son of God, begotten from the Father before all ages, God from God, Light from Light, true God from true God, begotten, not made; of the same essence as the Father. Through him all things were created; all things that are on the earth and in the heaven. He descended from heaven, it means that, he is divine and has a heavenly dignity. He is a God who embodied and personified as a human. He suffered for human’s salvation and was killed. On the third day he rose from the dead and resurrected. His current place is in heaven, that is, he ascended again. He will Fulfill his salvation deed is his Second Coming. He will have a Second Coming to judge both the living and the dead. So the Second Coming of Jesus is the final loop of his salvation deed for it he descended from heaven and was embodied; that is, if we omit Christ’s Second Coming from this cycle, believe in Christ will not be meaningful anymore.